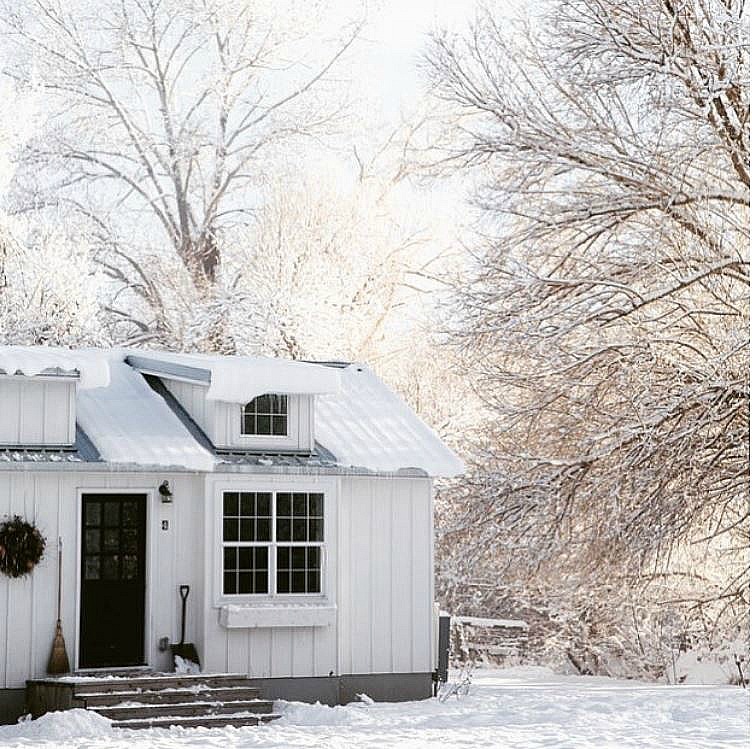 Carmella Rayone and her husband Russ live happily in a small (some would say tiny) 665-square-foot cabin in Wyoming with their three boys and a dog named Nellie. After some dark financial days that included unexpected layoffs and selling their former $240,000 house in Florida for only $80,000, they realized they could live with less. A lot less. Let’s take a look at how they’re making their little house work for their family of five. I find Carmella’s blog and the stories she tells from her small house truly inspiring. It’s always fun to see how magazines stage a room. For instance, in that cover shot, Carmella’s kitchen walls are green. In real life? “Pure White” by Sherwin Williams. She says the chairs were brought by the production crew and actually painted green on site! Carmella says they created “sunlight” for the photos with a strobe light set up outside the window. In 2012 Carmella drew up the plans for the kind of house they wanted for their family of five. 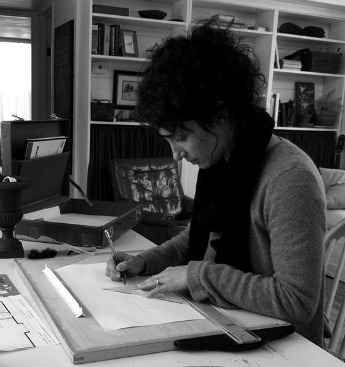 She had worked as an interior designer and knew how to sketch plans to give a builder. 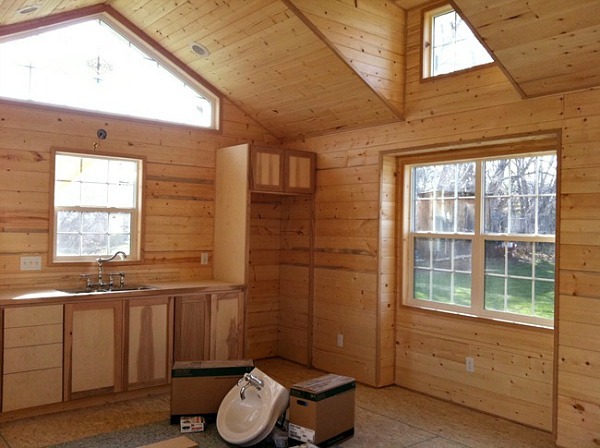 Amazingly, they spent well under $100,000 building and finishing the tiny house and didn’t go into debt doing it. 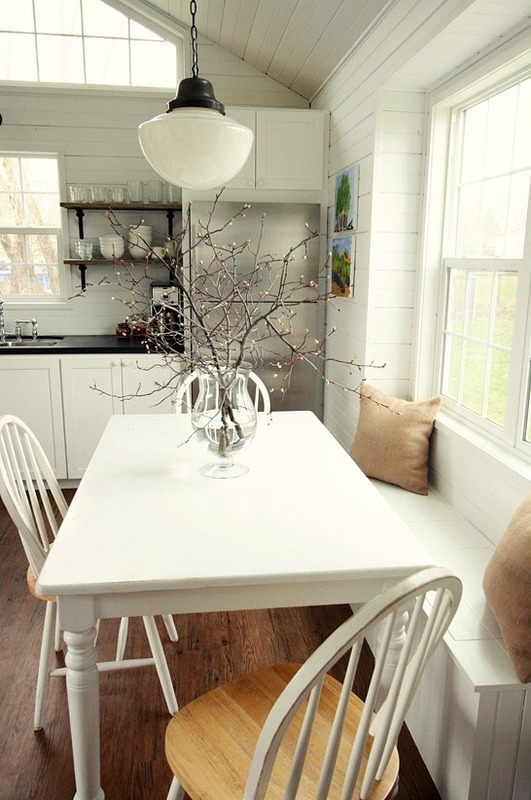 Amazing the difference some white paint can make in a space like this! “We gave up much. We gave away much. We sold much. But we gained even more. For us, financial security was no longer linked to the size of the portfolio or the potential of real estate holdings; financial security now meant zero debt and a job well loved. “We look back now on the bit we’ve come, and we can’t help but smile. Now, we live with intention; purpose marks our days as we learn and we grow, with falling down and rising up, in this new life. “We’ve traded burdens for breath. counters for the kitchen in the movie Something’s Gotta Give, too! for other people who are interested in building one and living a simpler life, as well. Many thanks to Carmella for sharing her story and her house with us. 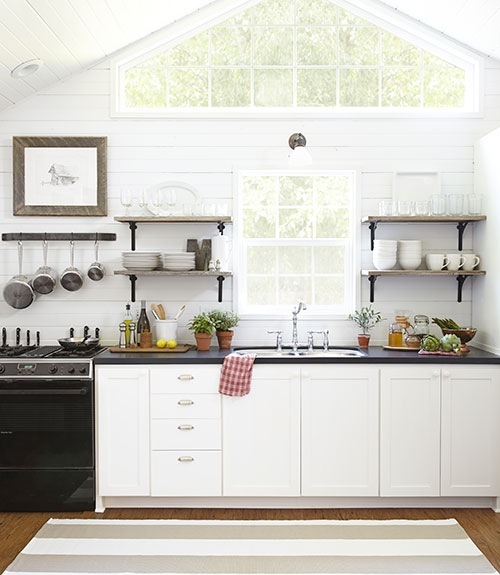 Visit her blog to learn more about their adventures in simplicity and take the whole-house tour. You can also follow her on Instagram. 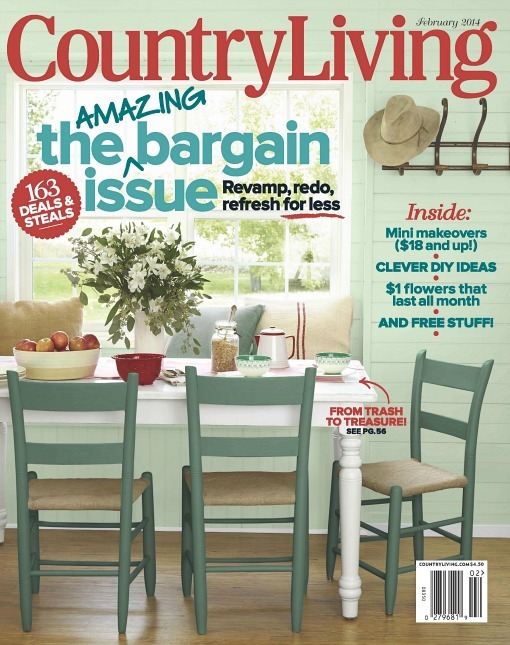 Go to Country Living to see their article about the small house by Victoria Pearson. Thanks for sharing this inspiring story! I am looking forward to checking out her blog. Wow! This is a great example! We don’t need too much to be happy in a home, do we? I love every inch of this precious home! What a great, cozy house, and I agree, I love her outlook! I love seeing houses like this that remind me it’s not about having more space, it’s about making the most out of the space you have. Thanks for sharing! 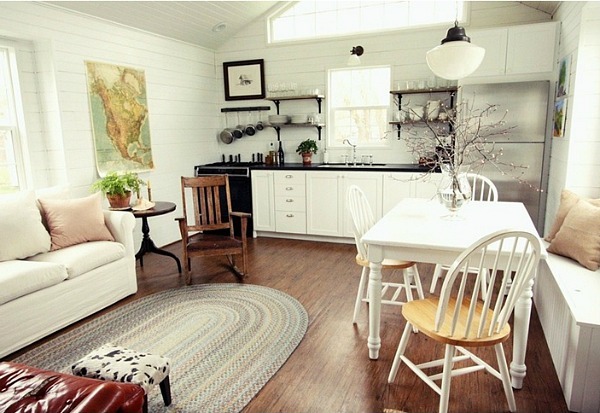 I absolutely fell in love with their cabin from that Country Living issue. I felt like I could breathe easier just looking at it! She did such a beautiful job with the decor and I would love some small town living myself. So gorgeous. Julia, thank you for such a great article! It’s such an honor to be included on your site! Really, thank you. I voted for you, Julia. You aren’t in last place anymore, BTW. Cool. It’s nice to be reminded that we don’t need stuff to be happy. I just want someone to interrupt a fake House Hunters home visit and say, “Hold on a minute! You do NOT “need” granite and stainless! You do not HAVE to have an en suite master bedroom the size of a ballroom. You do not NEED a “man cave”. Get a grip!” This is not going to happen any time soon, but it’s what these people have realized and it’s great, plus the house is cute. I agree! 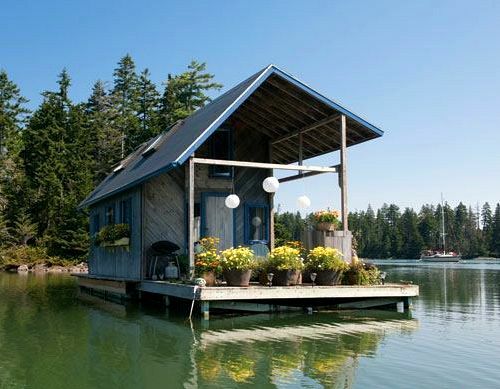 I love these tiny homes. They look so inviting. I’d love to see a floor plan. She may have one on her blog if you look around, but I don’t remember off-hand. A study plan of the slightly larger cabin that I’m drafting right now will be available to see on the blog soon. These plans are for a 900 sq ft version of our cabin (ours, only better) and will be available for purchase this spring. What an inspiring post! 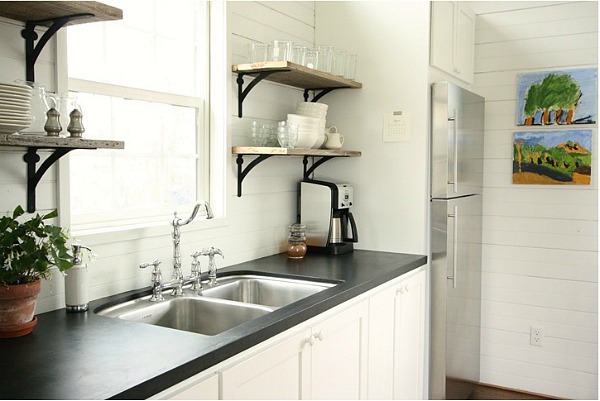 I have been dreaming of soapstone counters for our new/old home… dreaming because we are paying a crazy amount for son number two’s college tuition! 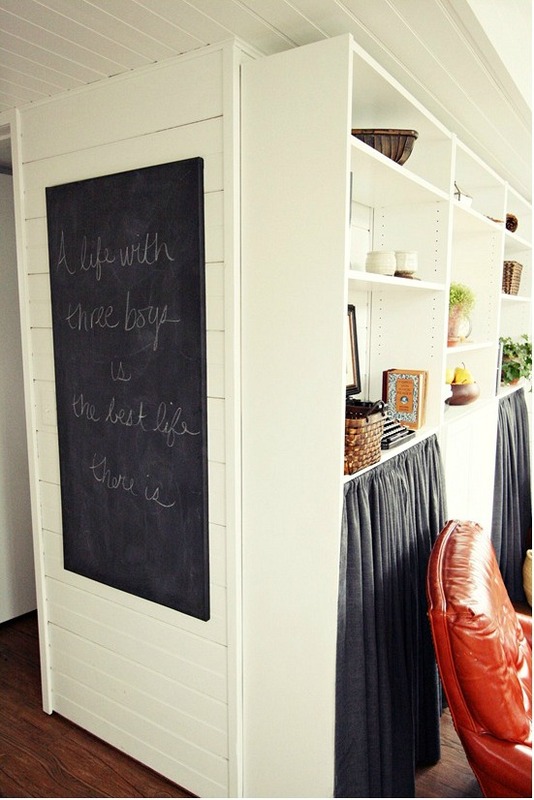 ( and as the mother of three sons, I wholeheartedly agree with the chalkboard sentiment in the photo!). You may have given me just the solution I needed! Thank you! Off to cast my vote for you, julia! What an inspiring story. There’s such pressure to have the biggest and best of everything and this family has shown that happiness is found in the exact opposite. My husband and I have recently discussed downsizing to a smaller home so we can be debt-free when our children begin post-secondary education. These days, the cost of maintaining a home is increasing at a rate beyond comprehension. I think it’s just a matter of taking a deep breath and deciding what we could live ‘without’. Thank you for sharing, Julia. I had seen the article in Country Living and wondered how on earth a family of five lives in 665 square feet. Our vacation cabin seems small at 1440 square feet, but I guess it’s all how you look at things. As I’m purging our primary home to sell and move into the cabin, I can appreciate what it takes to get rid of things. I admire Carmella and her family for realizing what they truly wanted and for having the courage and vision to make it happen and live modestly within their means. Their little house is lovely and their story an inspiration. I’m trying to get up the nerve to purge a lot from my stuff and this story is inspiring. There really is so much in life that is unnecessary…luxuries that we classify as necessities. Thanks for sharing this inspiring story. I also live with my family in a small house in an area where 4000 sq ft. Mc Mansions abound. I love my small house and wouldn’t trade it. I also love the peace of mind that comes with living within our means. I will definitely be checking out Carmellas blog for more on their story. I had seen an article about this family before–but I love how you show how the magazine changed things! I actually prefer how the family has it to the way Country Living did it. I really admire this family and the courage it took to start a new life. Although I do not live in a “small” house, I think their message is very important….we as as society are too attached to “things”. However, from a personal point of view, I would have a hard time in that kitchen. There isn’t enough counter space for me to make my grandmother’s pierogi! My sister-in-law is a great cook and had a smaller kitchen like this in her last house, so she bought a long folding table that she’d bring out when she needed extra space for cooking big meals for family gatherings. It worked pretty well! Yes, I make a Norwegian heritage flatbread that requires elbow room, a rolling pin and board and a large electric griddle – oh, and LOTS of flour! I just set up my station at one end of the dining table, which works especially well for me as it fits my height better than the counter, too. I’ve always been curious about making pierogi! Boo! to staging. I’d really rather see how people live in their spaces. I can see tidying and editing, of course, to make the best of what IS. But bringing in furniture and accessories and photoshopping the colors? Staging for lifestyle magazines is the equivalent of the problem with super skinny models. They make us aspire to an impossible ideal. Cudos to this family for their lifestyle choices and the elegance with which they’ve pulled it off! I really admire Carmella and her family’s commitment to living a richer life with less. There home is just lovely. And thanks for showing the link to their home before. I think Country Living missed an oppty to celebrate the truth here, less is more. What Carmella had decorated with her family was simply lovely, and we don’t need camera cheats to make us appreciate it more, like a table that doesn’t fit or special chairs that weren’t comfortable or chosen for the home. It is like photoshopping beautiful women to make them unrealistically beautiful. Carmella and her family quit the falseness of chasing bigger, more, I would have been happy with her home through her eyes with the same talented photographer. 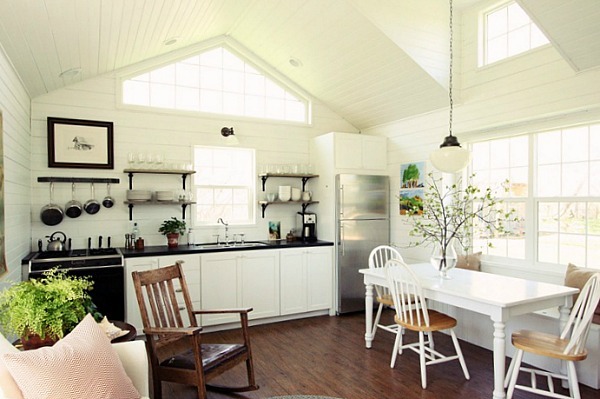 I actually love Carmella’s white, bright spaces…they are so much prettier to me than the photoshopped Cottage Living pictures. I loved this post, and as a mother of boys, I couldn’t help but imagine they have plenty of wide-open space outdoors where they boys can expend their energy, rather than hiding away in the other end of a big house playing video games! I’m so impressed by their decision. There is something so liberating about living within one’s means, so I’d imagine living debt-free is even sweeter! Kudos to them for making it work! PS- I voted for you too! You have a great blog and we all love it! Actually, I did really enjoy the Country Living article and I was so inspired by the couch that Carmella covered with Lowe’s drop cloths, that I decided to try the same thing with my own couches, which are still sturdy, but the upholstery has been wrecked by my three dogs and four children. I’m almost finished with the first of my two couches, and while it doesn’t look as nice as Carmella’s, it’s still a HUGE improvement. Thanks for the inspiration! I always wondered about those sunny rooms in magazines, too. I’m really thinking I need some strobe lights outside my windows that I can turn on when it’s gloomy out. Ha. Just wanted to let you know I cast my vote for you and to say thank you for one of the best blogs out there. Where else can I find fantasy millionaire houses, ordinary people houses, my favorite movie houses and bad real estate listings? You are original and entertaining! I wish I could vote for you again! That’s so nice. Thanks, Susan! I read some of Carmella’s blog, and I enjoyed her lovely writing style. She did say that they have two storage sheds – one for sports equipment and winter gear (a must with a family of boys), gardening equipment, and even books, another for a larder and large cooking/canning equipment. Well, that explained a lot. I was really wondering where they’d stashed that kind of stuff. Yes, especially without a basement or anything, those sheds would come in handy! I loved the article and also love Carmella’s blog, her photography and writing. Thanks for giving me the opportunity to revisit her story from Country Living. I agree about celebrating living smaller and wish I could see more examples like hers in more publications. “We’ve traded burdens for breath.” I need to write that somewhere in my home. Isn’t that a great line? I love her writing. Thanks, Cheryl! This is a great story and although I am sad for them that they lost so much money and their jobs, it seems like things turned out for the better. Tiny houses are my addiction and I so appreciate their cabin. We want to downsize in the future and this is a great plan. Thanks so much Julia for showcasing Carmella and their family home. And, even though you may not win a Homie, you are my personal best of the home blogs! Working amongst larger homes in the wild west, this is truly a breath of fresh air. Good for them! They get it. I too have lived in large houses on golf courses, commuted for hours to a job I hated. I had a similar life lesson. Now when I drive past large houses in fine neighborhoods I wonder to myself if these people are happy with their large house payments, the commute they must make daily, do they love their jobs. It must be a small percentage that do. I think just like everything else you have to do it once to know you did not need it after all. Their small house is very charming. I love she is starting her own business with the concept. She will be helping a lot of people. Thanks for sharing. I am forever mesmerized by the styling for a photo shoot! It really seems rather incongruous to change everything up when it was the homeowners home the magazine loved in the first place. But it is still very fun and interesting. Thank you for posting this. And I love their way of life. How refreshing. I eagerly look forward to your posts! Your blog is fantastic! Fascinating to see the changes they made. Now I wish I had a crew do my house just to see what they come up with. BTW, I like the white better. What a charming home! I love my small abode. Thanks for the story! What a beautiful home and amazing story. I have spent the last hour reading Carmella’s blog and enjoying her lovely home and family. I am glad to see a return to simple values and less stuff. Thanks Julia!! Your blog is full of wonderful homes and great stories. You all are so kind! Thank you! I’ve enjoyed these comments and conversations today. Best to you in the Homies, Julia! Great post as always Julia – having worked for over ten years on magazine photoshoots – yip, hands up – we do everything we can to make a home look as good as possible – including styling and lights outside windows etc ….. if we didn’t do all that stuff, I truly think readers would feel a wee bit bit let down – the features simply wouldn’t appeal in the same way. I hope I haven’t disillusioned your readers 🙂 It’s no different to a makeup artist applying lippy for a fashion shoot I guess. I always love hearing from behind-the-scenes of shoots like this. I think it’s fun when a blogger is featured in a magazine and can pull back the curtain to show what the room looks like in real life vs. the staged photos. Thanks, Marie! This home is truly charming! Any family of five should be happy to have this nice of a place.